Tuesday we celebrated National Margarita Day with 6 Fiesta-Worthy Margaritas. To celebrate Friday we’ve decided to turn up the heat by adding some red chili peppers. You may want to have a glass of ice water standing by to put out the fire. Cheers and here’s to the weekend! Wet the rim of a cocktail glass with a piece of lime, then turn the rim in a shallow plate of coarse salt. Garnish with a 2 inch piece of the chili. Slice a red hot chili pepper into slices. Place the pieces in the bottom of a cocktail shaker, add a splash of the Grand Marnier and muddle for 20 seconds or so. 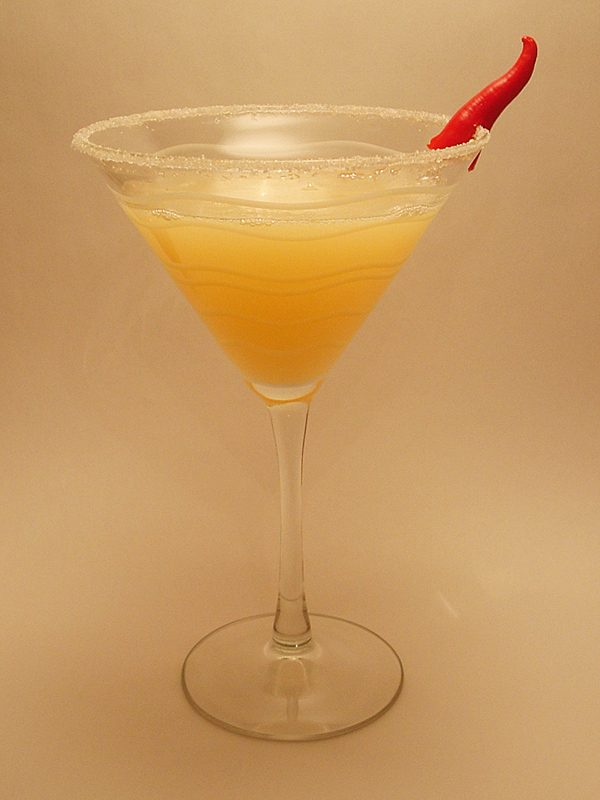 Add the tequila, triple sec, sweet and sour mix, orange juice and the rest of the Grand Marnier to the cocktail shaker. Add ice to the shaker, then shake the mixture for 10 seconds. Strain and serve.